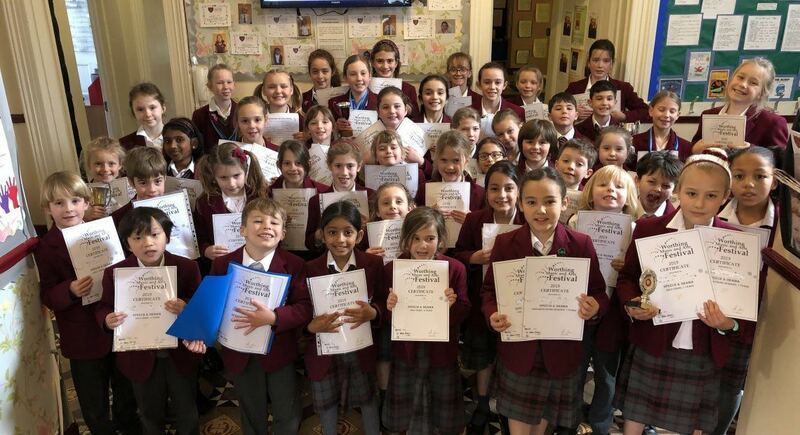 Congratulations to all the students who took part in the recent Worthing Arts and Music Festival. Our students really did themselves, and the School, proud. 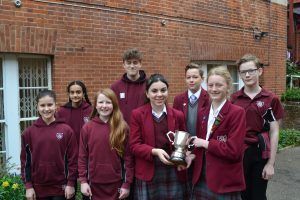 First place and the Music Industries Cup was awarded to a group from the senior school (Harvey, Ben, Flora, Lara and Skye) for improvisation. They also received a medal each for their amusing scene entitled “Call the Fire Brigade”. Flora won the “Speaking your own poem” class (ages 12-19) for her moving verse to commemorate Armistice Day and came third for the Solo Verse (12 years) class. Lara came second for both prepared prose reading and solo drama and qualified for the finals. Tabitha came second for prose reading. Skye came third for both solo verse and solo drama. First place and the Marguerite Beale Cup was awarded to Annie for prose reading, she also came second for solo drama, second for speaking her own poem and third for a duologue with Betty. Annie qualified for the Junior Finals. Lola won the Beale trophy for solo Verse and came second for prose reading. Amber was awarded the Dolphin Cup for speaking her own poem, took first place for prose reading and solo drama and third place for solo verse. Amber came second with Emilia with their duologue. Amber also qualified for the Junior Finals and was the runner-up for the “Worthing Junior Drama Festival Performer of the Year.” She was presented with a festival award and prize by the Mayor of Worthing. Amy was honoured with the Osbourne Trophy for being “the most promising 8 year old “. Second places were gained by Roman for solo verse and reading, Olivia for solo verse, Amy for reading, Gethin for solo verse and Sofia for prose reading. Matilda came second for solo drama and third for both solo verse and prose reading and qualified for the Junior Finals. 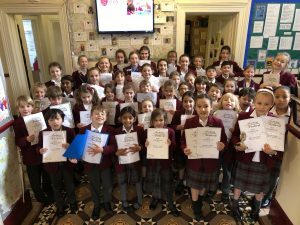 Third places were awarded to Tilly for solo verse, Betty for solo verse, solo drama and duologue, Italia for solo verse, Jack, Rose and Reubens for solo verse, Emilia for solo drama, Esther for solo drama, Janani for prose reading and Emma for solo verse. Mrs Ware, our Speech and Drama teacher was honoured to be presented with the Millicent Gorton Challenge Trophy for Speech Education! Following on from the Festival results, we are delighted that Lola from Year 3 and Amber from Year 6 were chosen to appear in the Festival Gala to perform their drama pieces.